The present church is essentially the structure recorded 1002, although the apse was rebuilt in the Gothic style in the late 13th century. However, its underlying architecture is obscured by its later decoration. ✴The monks would have worshipped in a choir located in the apse. ✴The lay congregation would have been largely confined to the nave. In 1436, when the monks transferred to the Cassinese Congregation, this liturgical practice was transformed. In particular, the monks' choir was located in the crossing, in front of the high altar. For this reason, a new high altar was built in 1436 and adapted in 1493 to accommodate a new altarpiece that had been commissioned from Perugino (see the page Art from San Pietro). This huge single-sided polyptych was installed in 1500, when the altar was consecrated. 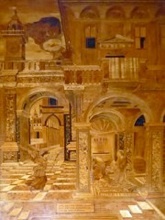 Francesco di Guido di Virio da Settignano worked continuously in the abbey in the period 1506-36, over-seeing the remodelling that was in part required by the liturgical changes. Abbot Giacomo di San Felice da Salò (1591-5) instituted a further programme of re-modelling in the light of post-Tridentine practice. He appointed Valentino Martelli to supervise work on the abbey, a post he held throughout the period 1591-1630. The most important requirement was that the monks' choir should be moved from the nave to its current position behind the high altar. Perugino’s polyptych was dismantled in 1608 and the altar was re-consecrated in the following year. ✴They were moved to the sacristy while work was carried out in the apse in 1534. ✴They were recorded as being once more under the high altar in 1573. ✴They were moved to a new coffin and moved once more to the sacristy to permit the remodelling of the apse in 1592. ✴They were translated back to the high altar in 1608. Francesco di Guido di Virio da Settignano was responsible for the two gilded stone pulpits that flank the presbytery. The beautifully carved choir stalls, which were originally in the centre of the nave, were begun in 1525, but work was halted for a period because of an outbreak of plague. 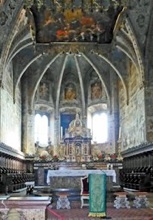 It resumed under Stefano Zambelli da Bergamo and was completed in 1535. Guido di Francesco da Settignano, who took over project management after his father's death, built the enclosing choir walls in 1535. ✴the baby Moses being hidden in the Nile. 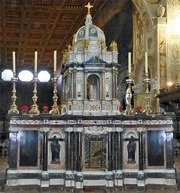 Valentino Martelli designed the present high altar. The grill in the centre at the back (seen in the illustration above) gives a view of a reliquary containing the relics of St Peter Abbot. The tabernacle (1627-35), which replaced Perugino’s altarpiece (see below) here, was made in Rome to a design by Valentino Martelli. The associated silver altar frontal (1627) was taken to France in 1797 and has been replaced by a modern copy. ✴the panel of the Trinity with SS Peter and Paul on the baldacchino above the high altar (illustrated to the right above). Pietro Rancanelli was probably the “Maestro Pietro” who was documented in 1592 as an associate of Silla Piccinini (see above) at San Pietro. The frescoes in the church that are attributed to him include those of allegorical figures in five lunettes on each side of the crossing (which include the three of those on the right that are illustrated here). The 18 columns in the nave probably originated in ancient Roman buildings, and might have been recovered from the earlier church. The gilded ceiling (ca. 1554) is the masterpiece of Benedetto da Montepulciano and Benvenuto da Brescia. These frescoes in the nave are attributed to Benedetto Bonfigli, and might have been associated with a payment made to him in 1465. Both frescoes have been heavily repainted. ✴The fresco of St Peter Abbot is on the 2nd column of the left, which is known as the column of the miracle. This refers to an accident that happened in ca. 966 during construction, when the column fell and nearly killed a workman. However, St Peter was able to stop it in mid air by making the sign of the Cross. The column remains asymmetrically mounted on its base: the fresco and the cross is carved on the capital above also record the miracle. ✴The fresco of St Benedict on the opposite column on the right. •St Peter released from prison by an angel. These frescoes, which have been detached and transferred onto canvas, are now on the counter-facade. ✴ten large panels that are arranged above the colonnades in the central aisle. In this latter series, each panel depicts a scene from the life of Christ, with another scene from the Old Testament that foreshadows it in the background. 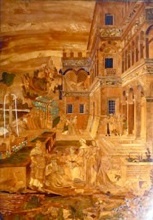 The series continued the narrative of the broadly contemporary frescoes in the apse, an approach encouraged by the climate of the Counter Reformation. These frescoes of busts of saints and bishops in the frieze along the top of the walls of the nave are attributed to Benedetto Bandiera. ✴the sacristy, which is between them. This altarpiece in the 1st bay depicts the Madonna and Child with SS Mary Magdalene and Sebastian. It is attributed, somewhat uncertainly, to Eusebio di San Giorgio. This panel in the 3rd bay is by Orazio Alfani. This panel in the 4th bay is by Francesco Appiani. This panel by Giacinto Gimignani in the 5th bay depicts a miracle that happened during construction of San Pietro in ca. 966, when St Peter Abbot was able to stop a column from falling on a workman by making the sign of the Cross. This altarpiece by Cesare Sermei is in the 6th bay. ✴the "Vision of St Gregory the Great" (in the 9th bay), in which St Michael appeared to him above Mausoleum of Hadrian, sheathing his sword as a sign of the end of the plague of 590 in Rome. The Castel Sant' Angelo, which was subsequently built on the site, can be seen in the painting. Cardinal Bevilacqua was so pleased with these panels that he invested Salimbeni with the Order of the Golden Spur and authorised him to call himself Cavalieri Bevilacqua. This altarpiece depicts an unhistorical event: Pope Gregory the Great confirms the Rule of St Benedict, who commends his brothers to the Pope. 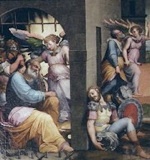 The predella contains nine small panels depicting scenes from the martyrdom of St Catherine. Since the subjects of the two parts of the work are unrelated, it seems unlikely that they belong together. The attribution of the panel itself to Eusebio di San Giorgio is highly dubious; the attribution to him of the predella is more plausible. A document of 1792 records that: “In the rooms [of the abbot, there are panels depicting] SS Benedict, Scholastica, Maurus, Placidus, Flavia [. . .] in half-length figures. They are all beautiful copies taken from various originals of Raphael, Pietro Perugino and other illustrious men, by ... the most accurate Sassoferrato”. The panels of SS Benedict and Scholastica are in the abbey. This panel by Bonifacio de’ Pitati da Verona , which is also above the door to the monastery (between Sassoferrato’s copies of Perugino’s SS Placidus and Maurus, above), depicts the Madonna and Child with St John the Baptist and a female saint. This panel between door to the monastery and the door to the sacristy is by Orazio Alfani. ✴St John the Baptist as a young hermit in the desert . Although they were listed among works to be sent to the Musei Capitolini, Rome in 1812, it was subsequently decided that they should remain in the church. ✴St Benedict saving St Placidus from drowning. 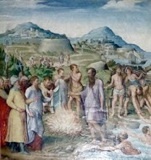 This panel, which now forms the altarpiece in the 5th bay,was part of Perugino's Sant' Agostino Polyptych (1502-23), which was painted for the high altar of Sant’ Agostino. The panel, which depicts the Pietà with the Virgin, St John the Evangelist and Joseph of Arimathea, was one of the seven panels from the polyptych that Napoleon's commissioner, Jacques-Pierre Tinet selected for confiscation in 1797. Antonio Canova recovered it in 1815 and it was given to the monks of San Pietro: this was in recompense for two panels that were (somewhat dubiously) attributed to Raphael, which had been confiscated from the church by the French in 1797 and subsequently lost. (Most of the other panels from the Sant' Agostino Polyptych are now in the Galleria Nazionale). This crucifix in the 6th bay is almost certainly the one that the monks of San Pietro commissioned from Giovanni Tedesco in 1478. This altarpiece in the 7th bay, which is by to Giovanni Battista Salvi, il Sassoferrato, was based on a predella panel from Raphael’s Pala Oddi (1503). It was listed among works to be sent to the Musei Capitolini, Rome in 1812, but it was subsequently decided that it should remain in the church. (The original by Raphael was in San Francesco al Prato until 1797 and is now in the Pinacoteca Vaticana, Rome). This panel by Orazio Alfani is in the 8th bay. This altarpiece in the 9th bay has been associated with a payment made by Donna Leonarda Olivieri Baglioni in 1509. Documentation linking the work to Eusebio di San Giorgio was published in 1906. 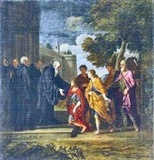 The altarpiece was listed among works to be sent to the Musei Capitolini, Rome in 1812 (at which time it was attributed to Dono Doni), but it was subsequently decided that it should remain in the church. This altarpiece by Giovanni Battista Salvi, il Sassoferrato is in the 10th bay (between the Cappella del Sacramento and the Cappella Ranieri). It was sent to the Musei Capitolini, Rome in 1812 but returned to the church in 1815. This panel by Giovanni Battista Salvi, il Sassoferrato is in the 11th bay ( between the Cappella Ranieri and the Cappella Vibi, in the left aisle) is a faithful copy of the main panel of Raphael’s Pala Baglioni (1507). 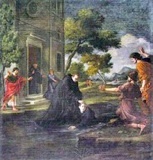 (The original was removed from San Francesco al Prato in 1608 and is now in the Galleria Borghese, Rome). These panels, which are attributed to Giovanni Francesco Barbieri, il Guercino are on the right (to the sides of the side entrance to the presbytery). This panel, which is attributed to Giovanni Lanfranco, is on the left, beyond Cappella Vibi. This panel of the Pietà with SS Jerome and Leonard at the end of the left aisle is undocumented, but used to carry an inscription that identified its date. It used to be attributed to Benedetto Bonfigli, but has been more recently attributed to Fiorenzo di Lorenzo. 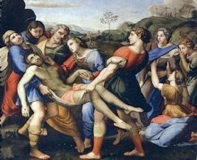 If the present attribution is correct, it is one of Fiorenzo’s earliest surviving works. Ugolino di Nuccio da Montevibiano, who was abbot in the period 1330-57, presided over a period of great prosperity at San Pietro. His marble tombstone, which was designed for the floor above his place of burial, is now in embedded the wall at the end of the aisle, under the Pietà (above).